Left: cryptic kelp crab among giant kelp. Photo by Kaia Bryce. Right: photo by Georgia Brander. Note the algae decorating the rostrum and front portion of the carapace on both crabs. One of this species' main identifying features, the colour of the pincers, is not visible from the angles of these images. 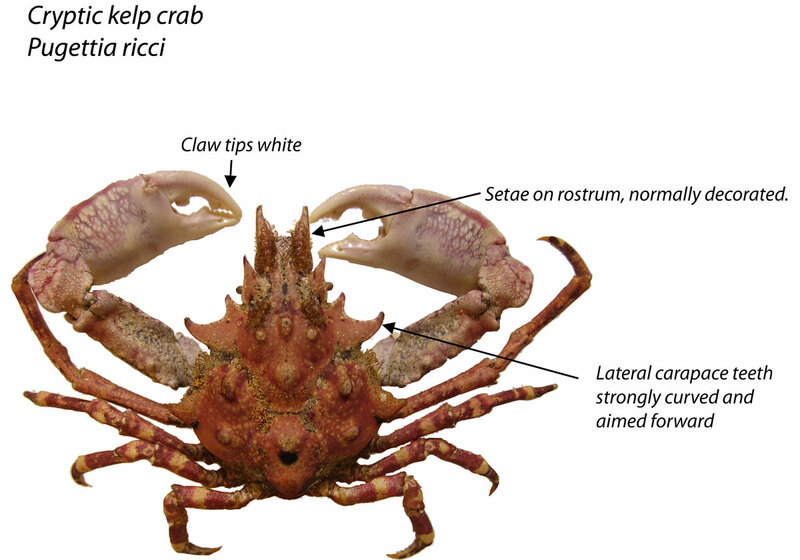 This crab can be identified by its bumpy, spiny carapace that has sharply projecting lateral teeth (indicated in this picture). It ranges in colour from dark brown to red, sometimes with some violet patches and white on the carapace bumps. The claws are reddish with white tips. Its carapace reaches 4 cm wide. Like other members of the Pugettia genus (e.g. P. producta, P. gracilis) the cryptic kelp crab usually only decorates its rostrum. Decorations include algae, coralline algae, and bryozoans. This species inhabits rocky areas of the low intertidal to a depth of 97 m (320 ft). It is only found on or near exposed outer coastlines, and tends to be associated with the giant perennial kelp. Its range stretches from Prince of Wales Island in Alaska to Baja California. 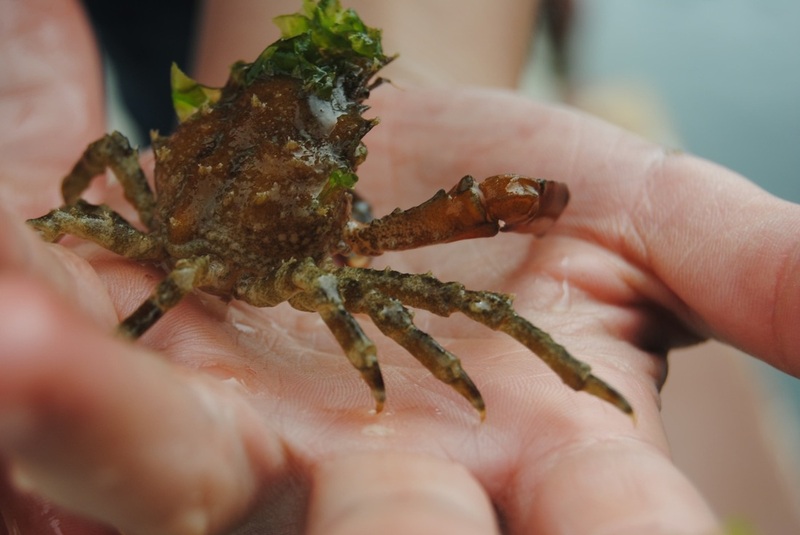 The cryptic kelp crab could be confused with the slender kelp crab. 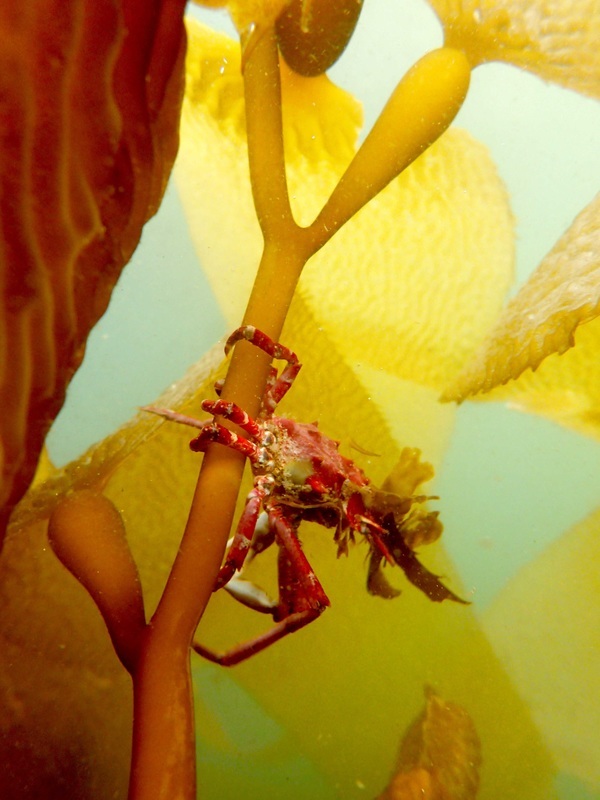 To differentiate these species look at the claw tips or "fingers", which are white on the cryptic and blue and orange on the graceful kelp crab. Also notice the carapace texture: the slender kelp crab may have a few carapace bumps, but lacks the sharp spines on the cryptic's carapace. The shape of the carapaces are different as well: the lateral teeth of the cryptic project much more sharply and are more curved than those of the slender kelp crab. 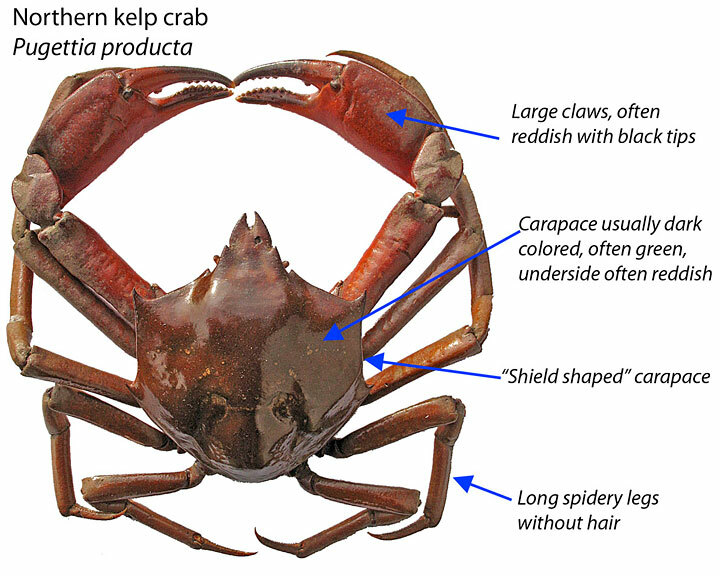 Carapace shape also helps in determining a cryptic kelp crab from the generally larger and smoother northern kelp crab. These shape differences are clear when this cryptic kelp crab is compared with this slender kelp crab and this northern kelp crab. Harbo, R.M. (2011). Whelks to whales: Coastal marine life of the Pacific Northwest. Madeira Park, BC: Harbour Publishing. P. 105. Hart, J. (1984). Pugettia richii Dana, 1851. In Klinkenberg, Brian. (Editor) 2012. E-Fauna BC: Electronic Atlas of the Fauna of British Columbia. Lab for Advanced Spatial Analysis, Department of Geography, University of British Columbia, Vancouver. Accessed 01/04/2014. Jensen, G.C. (1995). Pacific Coast Crabs and Shrimp. Monterey, CA: Sea Challengers. P. 22.